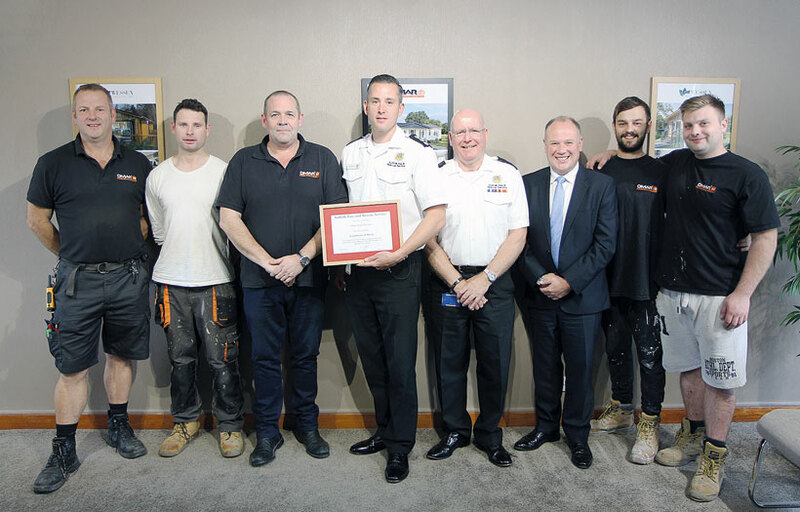 Omar Group receives safety award from the Suffolk Fire and Rescue Service. Omar Group is proud to have been presented an award by the Suffolk Fire & Rescue Service in recognition of their support to the local community as an employer of on-call firefighters at Brandon Fire Station. On-call Firefighters are a vital part of the Suffolk Fire and Rescue Service, working in small towns or villages from home or their place of work. Trained to the same high standard as whole-time firefighters, including training in first aid and trauma, emergency response duties can include road traffic collisions, forest and heathland fires and domestic and industrial fires. On-call firefighters also assist the RSPCA with animal welfare issues such as trapped animals and help in the local community with youth education – conducting fire station tours and talks for local children. The fire station at Brandon consists purely of On-call Firefighters and four (soon to be five) of the eleven are employed by Omar – Les Field, Lloyd Kent, Jason Spooner and Craig Tyson. Emergency calls can occur at any time and, on average, the team is called out around 30 times a month during the summer, many of which are during work hours, although in July, during the heat wave, this increased to around 50. Henry Griffin, deputy district commander for the Suffolk Fire and Rescue Service, who nominated Omar said: ‘We’re incredibly grateful to Omar Group for their continued support.’ See www.omar.co.uk or call 01842 810 673 for more on Omar.